The California High Speed Rail Authority recently added to its website the text of a new Memorandum of Understanding (MOU) that will soon be signed with the Peninsula Corridor Joint Powers Board (PCJPB, a.k.a. Caltrain). This document, hammered out by the two parties, establishes an "initial organizational framework" whereby the PCJPB and CHSRA become partners in the planning, design and construction of improvements to the Caltrain corridor. 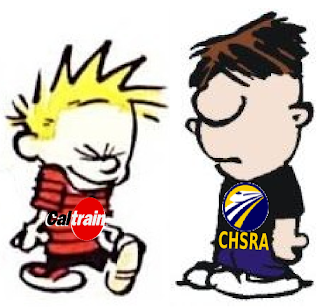 The CHSRA already approved it at their March 5th board meeting; approval by the Caltrain board of directors is expected at their next meeting on April 2nd. A new Program Director, reporting to both the Caltrain and HSR executive directors (Michael Scanlon and Carrie Pourvahidi, respectively) will coordinate and oversee the work of the staffs and engineering consultants of the two parties. Caltrain will continue to operate during HSR construction. 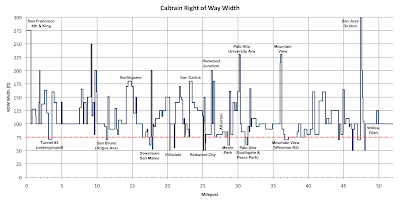 The needs of Caltrain must be considered, including the ability to operate 8 trains per hour in each direction (as already set forth in the Caltrain 2025 plan). The peninsula corridor and all existing improvements belong solely to the PCJPB. How and to what extent will the two organizations (governing boards & staff) be integrated? Who will be liable for what? Who will own what, after the project is completed? The MOU states that all these things will be planned. As the saying goes, "the planning will continue until we find out why no decisions have been made." UPDATE (3/18) Thanks to Martha Martinez, PCJPB Secretary, for providing the full text of the 1991 trackage rights agreement that governs freight access on the peninsula. Freight trains operate daily along nearly the entire length of the Caltrain corridor (San Jose photo at right by Michael Patrick), and make up less than 5% of train traffic on the peninsula. The freight trains move mostly at night, when Caltrain traffic is sparse. Freight trains have always been part of the traffic mix on the peninsula. The corridor formerly belonged to freight operator Southern Pacific, which sold the 51.4-mile railroad right of way to the Peninsula Corridor Joint Powers Board (Caltrain) in 1991 for $219 million. Union Pacific currently operates three freight trains per weekday, all based out of the yard next to the South San Francisco Caltrain station. SOUTH CITY SWITCHER: Goes on duty early in the morning: switches industries between South City and Pier 96 in San Francisco. 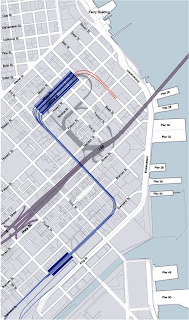 Shippers include Granite Rock, Central Concrete and Pacific AgriProducts in SSF; Sierra Point Lumber near the Bayshore station; Dean's Refrigerated Trucking off Carroll Avenue in SF; Darling International, a rendering plant near Pier 96; and the Waste Solutions Group dirty-dirt concession at Pier 96. Famous for being the last freight train serving San Francisco. A sizable photo archive detailing this operation can be found here. MISSION BAY HAULER: Goes on duty at 6:30 p.m.; gathers up all the outbound cars brought in by the other two locals and hauls them to the UP yard in Milpitas, then returns with the inbound cars for distribution by the locals. This train can easily see 60 to 90 cars. All existing plans for improving the Caltrain corridor (namely, Caltrain's 2025 Plan, including electrification, as well as California high speed rail) explicitly preserve the capability to carry freight up the peninsula, and allow for a possible expansion of freight traffic. Whether this is justified by existing traffic levels (less than 5% of train movements) is open to debate. If freight service on the peninsula were discontinued, some traffic would likely move by truck over Highway 101, and the rest of it, and associated jobs, might disappear altogether from San Francisco and the peninsula. Regardless of actual demand, the peninsula freight operator, Southern Pacific (and its successor, Union Pacific) retained trackage rights from Caltrain when the latter acquired the tracks, giving UP the right to operate a certain quota of freight trains on the peninsula. Such agreements are administered by the Surface Transportation Board, and would likely be difficult to terminate not only because of the bureaucratic process, but because UP (no supporter of the HSR project) might attempt to use their rights as a bargaining chip against the high speed rail authority. So, while freight accounts for only a tiny minority of train movements that is likely to become infinitesimal when Caltrain service is expanded and HSR service begins, all agencies involved are proceeding under the firm assumption that freight trains will be accommodated for all time--regardless of whether or not this makes sense from an economic or technical standpoint. The Department of Defense designates a nationwide network of rail links critical to national defense, known as the Strategic Railroad Corridor Network, or STRACNET. 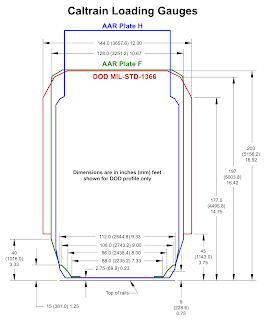 weight capability, to allow M-1 tanks to be carried in pairs on 140-ton flat cars. Why would we care about this Cold War relic? As it turns out, the peninsula corridor is part of STRACNET, or at least it was according to the 1998 update (see California map on page 30), presumably to access the mighty port of embarkation known as San Francisco--never to be outdone by its far bigger rival across the bay. The makeup of STRACNET is updated every few years by the DOD and FRA; there is no guarantee that the peninsula corridor will retain its military designation. Because the Caltrain corridor already accommodates daily freight trains (see Caltrain's clearance standards, also drawn as a green outline in the figure at right), Caltrain more or less meets the STRACNET requirement (red outline). 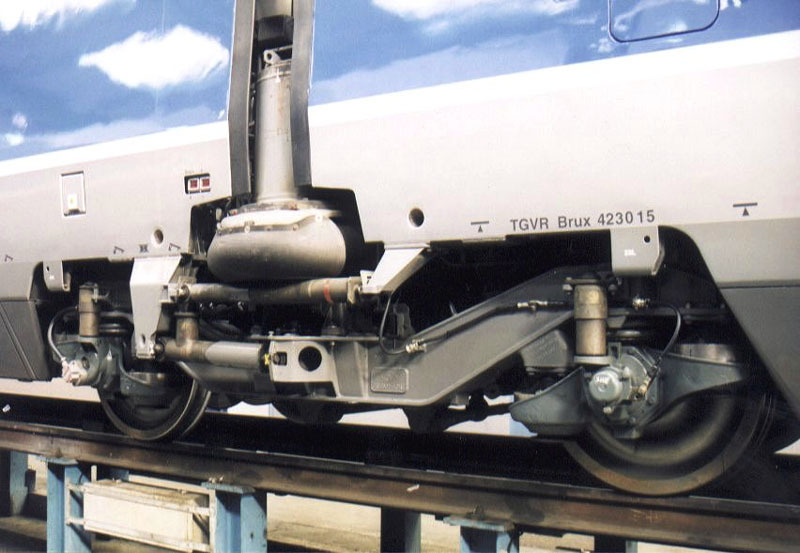 Its track maintenance standards exceed the operating speed and weight requirements. Beyond the loading clearances shown at right, available structural clearances are much wider than required by the DOD because Caltrain already complies with the draconian clearance requirements of the California Public Utilities Commission. Bottom line: STRACNET is a yawner, although that is unlikely to stop HSR opponents from making an issue out of the grievous omission of STRACNET from CHSRA environmental impact documents. Freight service (in addition to HSR) has a few important implications for the future of the peninsula corridor, none of which are likely to be welcomed by neighbors. More Tracks. 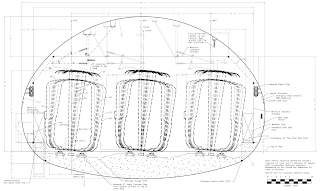 The 125 mph speed envisioned for HSR on the peninsula requires tracks to be banked in curves (see the Top 10 Worst Curves for more technical details), with the outside rail raised as much as 6 inches higher than the inside rail. This steep banking is incompatible with slow and top-heavy freight cars and can lead to derailments excessive rail wear. The CHSRA's plan for four tracks along the entire length of the peninsula is likely to be driven just as much by the perceived need to accommodate freight trains (by having one pair of tracks banked, and the other pair not) than any service pattern considerations to allow trains of differing speeds to overtake each other. The need for four tracks may be somewhat alleviated without freight trains. Taller Electrical Poles. 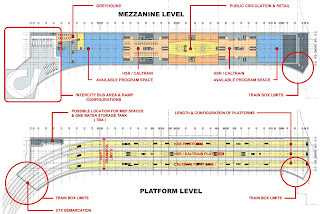 Track improvements are being designed to increase Caltrain's clearances from AAR Plate F to the much taller AAR Plate H. This would allow "excess height" freight cars such as autoracks and double stack container cars--never mind for which supposed customer on our dead-end peninsula! 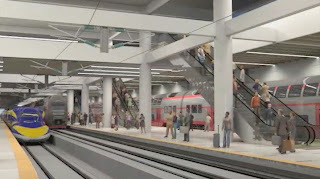 Expanding from the existing Plate F condition to Plate H requires another 3 feet of vertical clearance, which will force the overhead electrification of the tracks to be built at least 3 feet taller, thus increasing visual blight. More Noise. Freight trains are generally not maintained to the same high standards as high speed passenger equipment. Freight trains with diesel locomotives and wheel flat spots banging along the track will be much louder than electric trains, even after horn-blowing is obviated by grade separations. Accommodations that are now being made for freight operations may lead to an increase in noisy freight traffic. 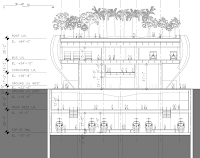 From the point of view of civil engineering companies who will design and build HSR infrastructure on the peninsula, every additional cubic yard of concrete and every design complication is a potential path to extra profit. To this end, the requirements arising from Union Pacific freight service and STRACNET may indeed be quite welcome. After all, if it's profitable, why not let the tail wag the dog?